I just wanted to say how much I love your product. I wanted to be able to travel cross country with my Yamaha R6, but did not want to take up all of my covered truck bed. I thought I would have to buy a trailer, but I found VersaHaul instead. I was skeptical at first but after a 40 hour road trip, I am very happy I purchased your product. Not only is it much easier to use than a trailer, I have my whole truck bed free for cargo, I can (usually) fit into a single parking space, and I do not have to worry about extra toll for a trailer. Thank you for a great product. Just wanted to let you know, I used your versahaul to both mount my TTR250 and tow a 10 foot trailer. I love the versahaul and talk it up to everyone. That is my 1999 4runner at 10,500 feet fully loaded. Not possible with a knock off hitch hauler. I just wanted to tell you I got the chance today to try my single motorcycle carrier on the back of my Jeep and found it to be a very solid unit. The bike fit perfectly on your carrier and the VersaHaul's stability gave me "peace of mind" going down the road. I was impressed with the retractable tie down bars. What a knee saver! I'm looking forward to showing my friends my VersaHaul because I'm sure they will be as impressed as I am and I will gladly recommend your products to them. I recently purchased your Versa-Haul (Single Carrier). 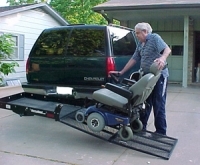 It works great and I am impressed how easy it is to load and unload and very stable on the highway. See attached photos. "life has not been as kind to da rad wife as it has been to me. she has struggled with multiple sclerosis for the last 15 years or so. my one time constant ride'n partner now must be content to just listen to my boring ride'n stories. a recent epiphany resulted in get'n a little rv and hang'n a dual sport on da back so she could travel with me to beautiful places like death valley and moab; and me, be'n the selfish [person] that i am, can still ride. here da rv be with orange nasty hang'n on da back wait'n to get off and rip up the cascades in a couple of days." You restored my faith in American business with this kind of response. If only some other companies I have dealt with stood behind their products as you do. 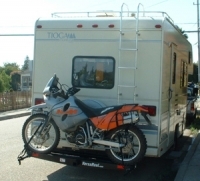 I carried my Honda XR200 and XR100 on a 2000 mile trip with your Versa-Haul carrier. I am happy to report that they rode very securely on the back of my 87 Coachman Motor Home. The two-bike carrier made traveling much easier than with my old trailer. I didn't test my gas mileage but I'm sure it was better this year. I needed to be careful when pulling in and out of gas stations, but that aside, I'd gladly trade my trailer for a Versa-Haul any day! We picked up the bikes, and Gary put the carrier together in the lot. Several People commented on the carrier and really liked it. We told them how great you all have been in working with us. We would gladly recommend you to anyone. I ordered your Versa Hauler on September 21st, and on September 27th it arrived. The instructions were easy to follow putting it together. I put it on my Dodge 2500 4x4. It will hold my motorcycle for my deer hunting trips this year. I just got over a hernia operation. [It was a] Hockey injury NHL Old Timers game (but I did make the save). It is a lot easier putting the bike on your hauler than trying to boost it up to the bed of the pickup, and maybe getting another surprise like another hernia. Thank you for your helpful advice when I phoned you before I ordered one. It's all on the 2" receiver. The R6 only weighs 400lbs. The tongue weight for the 'Reg is 616lbs. The rack weighs 90lbs. So, there's 126lbs of margin. But, the load is farther away from the vehicle, so this margin is very good to have. I would not put a bike that weighed over 480lbs on the rack. There is a load stabilizer. So, no, not even a little bit of wobbling. I have wanted to drop you guys an email about how great your product is. 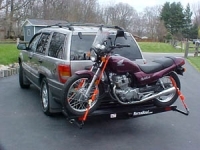 I bought a sport bike carrier that you make and it worked great, no problems what so ever. Most of all it saved my life, my wife's life, and my dads life, and 2 dogs lives. I was in a car accident back on may 22 2005, I had a 99 Lincoln navigator with my 2002 Honda CBR 600 on your sport bike carrier. I was at a red light on the brake and was hit at 70 mph by a 95 Chevy work van and pushed a 125 feet through the intersection. The next day when I looked at the carrier I could not believe that not one weld broke. It was intact. It just bent under the navigator and pulled the entire rear frame down to the ground. To do this your product has to be super strong. I say it saved our lives because yes it bent the navigator down but if it just broke I think the bike and van that hit us could have reached the passenger compartment and really hurt us. I ordered a sportbike carrier, July 26 2006, from the factory, second day air. It arrived at my house in Michigan July 27, less than 24 hours later, in time for our camping trip. Your product performed as advertised and I could not be happier with my motorcycle carrier. 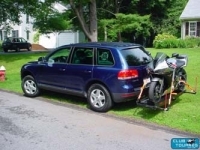 Complete satisfaction with Sport Bike Carrier !! I ordered the carrier Thursday morning and it arrived Friday. That was my first big surprise. Unpacked and assembled the carrier in less than a hour, second pleasant surprise. Great design, well enginnered, everything fit and all the pieces where there and nicely packed. Loaded my 06 Suzuki Hayabusa easily by myself and strapped it down. Left Saturday morning for Ohio visited then returned home to Indianapolis Saturday night. a 600 mile trip. Got much better gas milage that when I towed my busa on my trailer, it was much easyer to drive and back up than with a trailer, third surprise. Being able to load and unload my bike easly is extremely important to me because I'm 63 years old and disabled. I have my eye on some of your other products.. I have been using my VersaHaul all year for multiple track days and racing. It was really easy to assemble, is well built, and stores out of the way in my garage when I'm not using it. I keep it behind my roll-around tool boxes and it only takes up about 8" of space from the back of the tool boxes to the wall. I highly recommend VersaHaul to anyone!